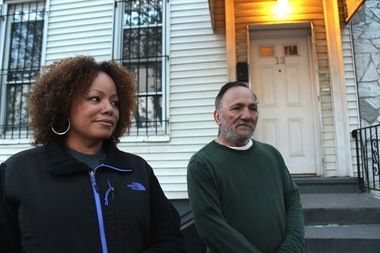 Ada Hernandez, 48, and her father Gregory Hernandez, 66, have lived on Ditmars Street for decades. BUSHWICK — The MTA has promised to pay moving expenses, provide 24-hour security for empty homes and cover rent for displaced residents and business owners during a six to ten-month reconstruction of the M train viaduct. The crumbling concrete M train elevated viaduct, a curved spur of the M train line that juts out from Broadway and connects to the tracks above Myrtle Avenue, needs to be torn down and rebuilt, and several homes and buildings come within feet of it. "We all understand this is the last thing you want to have happen to your lives," said Helene Cinque, a real estate specialist for the MTA at a Wednesday night meeting for Bushwick residents. "We will do our best to be fair and reasonable and do our best to make it as smooth as possible." 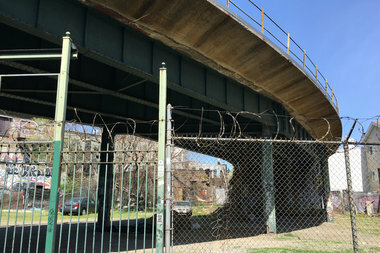 The Bushwick Cut that connects the M line to the J and Z trains needs to be repaired, according to the MTA. Eminent domain proceedings will begin alongside direct bargaining with residents, so if for some reason they change their minds and try to stay, the MTA will still have a legal means to force them out, officials said. Early on, some residents had vowed to fight the relocation, but since then, they'd received more information on how severe the repairs were and have since reconsidered, they said. "The work has to be done, it's really bad. In truth we have to be safe," said Anna Molina, 45, who lives on Ditmars Street. On Wednesday, the MTA finally tried to put to bed some of the pressing concerns that had been swirling around residents' heads for nearly three months since they learned through the grapevine that they would have to move. Ditmars Street residents will have to be out for around 10 months beginning in July of 2017, while two rental buildings and the businesses Harvest Cyclery and Little MO will be out for less time, around 3 months, officials said. ► The MTA promised to pay for moving expenses and for all accommodations during the relocation for renters and homeowners as well as offering a daily food stipend to displaced residents. ► Homeowners who rely on income from renters will also be compensated for that loss. ►Accommodations could be hotels or apartments depending on what residents are most comfortable with. ►In order to safeguard the empty buildings, the agency promised to hire a 24 hour security detail. ►Mesh and plywood would help protect the homes from shattering debris, and they planned to do photo-surveys of the buildings to document conditions before and after construction so that any damage would be paid for by the MTA. ►The area will be baited for rodents to try to prevent them from fleeing into the nearby homes during construction. While all of the homeowners turned out Wednesday night, very few renters did. To the few who did show up, New York City Transit President Veronique Hakim, said that if they didn't have formal leases they could work with the MTA to prove their tenancy in other ways. She also said that they should consider securing leases in other areas and not returning to their apartments. “This may be an opportunity to try a new neighborhood,” she said. While the MTA told one renter, Abby Campbell, 25, it would help with moving expenses and pay her rent in a new location, it would only compensate her if she moved next May, which would be impossible because her roommate will be gone for several months next spring for work. "Do it when they say you have to do it, or you just have to move and spend thousands of dollars," said Campbell. Their lease is up in August and they asked their landlord if they could extend it month to month, but the landlord refused. So Campbell and her roommate are planning to move in August on their own dime, she said. "We drained our savings account to be able to move, it's really frustrating." Starting in the summer of 2017, the existing viaduct will be cut up and dragged off in sections by cranes according Ray Wong, a project manager for the MTA. Then new sections of prefabricated viaduct will be pulled into place and connected. Low vibration tracks will be installed, meaning much less noise as the train rounds the bend once the new viaduct is complete. "Oh, that would be awesome," exclaimed Elizabeth Colon, a long-time homeowner on the block, accustomed to the noisy M train rumbling through her backyard. But doubts remained for some residents who still worried about the actual logistics of the project. "I'm just worried. I'm still scared. I don't feel comfortable yet," said Ada Hernandez, 48, who rents an apartment from her father who owns their Ditmars Street home. "I worry about my father, how will his mortgage get paid? How will his bills get paid?" "I don't want my father to struggle." The MTA told them that they would pay his utility bills and the mortgage but the actual logistics still seemed fuzzy to her. For others who live with extended families, relocation may not prove so simple. "I don't know. [I hope] I can find some house like where I live," said Yangchen Chodak, 46, who's lived in the home she and her family purchased on Ditmars Street for the last eight years. Chodak lives with her husband, four cousins, a niece and her two children. Since they learned about the M train viaduct reconstruction, her mother has come to live with them from India, though they haven't told her yet that they'll have to move next year. Despite the uncertainty, after Wednesday's meeting she admitted, "I'm feeling a little better."